This is a view looking west into the garden and vineyard. Yeah, we are a little sad to leave this. It is such an amazing time of year with tons of garden produce and green grass again. I feel bad because we will not be around to help with the rest of the canning (sorry Mom). Our friend Zendina was over this week and took some great photos with my camera while I was dealing with an extremely over-tired Colin. She has very beautiful children who Colin enjoys a lot (when he is not trying to run away with their things). They always give each other big hugs when they leave. Here is her oldest eating a garden carrot. Her kids have been very cute and love exploring the garden and grapes. We are very fortunate to have this amazing train set on loan from the Yakima Stuckis. We were up for a visit and the trains kept Colin in one place for up to 30 minutes. Thank you Yakima Stuckis! Colin gives me this face in photos a lot recently. Brian out did himself on this track. Colin even played with the track set up like this for 4 entire days. He usually plays for awhile then destroys, but he knew this was something special. He got these car jammies a few days ago and in a recent good night prayer he was thankful for car jammies. These saddles are in our living room. One was my grandpa's and one was my great grandpa's. I realize how very, very spoiled I have been to have Brian around so much and that most mothers have to deal with their children alone for 8-10+ hours a day. 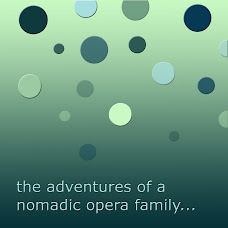 I am grateful for the opera schedule for when we travel since we really have a lot of family time together. We all have had a little cold this week but mostly seem to be over it by now. Colin has been out of sorts a bit without his Dada and Nana around. There have been a few melt-downs but he seems to be doing a little better, especially since Brian comes home tomorrow. It is cute because when Brian has a longer show where he has to fly we have told him Dada has to go to work on the airplane. I think Colin views this as Dada working on the airplane. I was telling Colin that Dada's work is singing and he told me that Dada is singing on the airplane. I have not enjoyed taking both kids out alone, so we have only left the house twice since Wednesday. I think Colin can sense my vulnerability and does not cooperate getting back in the car. It is not so fun to have Jane in a front carrier, a diaper bag and a huge squirming, kicking toddler under my arm. Oh well. It has been sweet to bring Jane into Colin's nighttime rituals. She loves the stories and songs and Colin wants me to leave Baby Jane to sleep with him. Our plan is for them to share a room but not quite yet. Brian is home soon and then we are quickly off to California. Wish us luck getting ready. We took some photos of my sister's good friend's children. The purpose was to get some senior photos of the oldest son, but with little girls this cute, it is a shame to not photograph them. There are many beautiful photos of them. Teen age boys not so excited by photos. Here is the senior. Even though he was not very excited for photos, he was very photogenic. Colin has been hard to photograph since he figured out how to get down from the stool I use for photography. (I used to be able to sit him on it and since he could not get down, I could get some shots.) But yesterday I wanted to try something and he willingly got on my photography stool and let me take a few photos of him. He is at a very cute little toddler stage. I kind of love his bed head. I told him we would take photos of him and his ambulance. He has moved on to emergency vehicles. Jane at 3.5 months. She is very happy and is a little bit more chubby than Colin was at this age. Colin needs to get in on the photos. New dress from Nana Hinckley. Jane still has to fill it out a bit. We have been doing many things but not taking photos. These two are courtesy of our friend Sue Anne since we left our camera in the car. 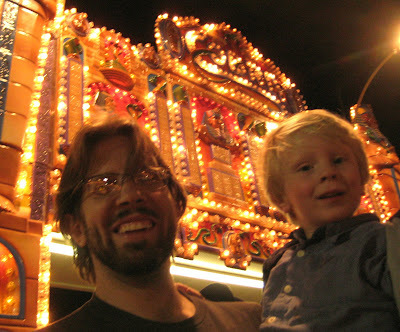 The fair was fun, even though both of our kids were acting up before we left and I did not even want to go. Colin was delighted with the Ferris Wheel. I could not believe the price as it took $12 for the three of us to ride (Jane stayed with Sue Anne.) But Colin was so excited it was worth it. (See his little face in the photo?) Brian should have entered his bread for judging and there actually was a pie contest the night we were there. It was some pie contest where Governor Huntsman was the judge. The Utah Fair still has nothing on the wonder that is the Indiana State Fair, but it was a good time. Colin is such a cute age for things like this, and Jane is so sweet and portable. Our time in Utah is winding down since the next opera is coming up soon. We will be sad to not be in Utah in October since there will still be more canning to do, but it is nice for Brian to be employed every now and again. Brian and I lead kind-of interesting political lives together as we come from very different political backgrounds. I should not even get into it. So we are currently just sitting around watching Colin's evening Curious George (part of the bedtime ritual) and Brian announces "I feel a cleaning binge coming on." Not to brag but I have a husband who says things like "I feel a cleaning binge coming on". I also only have to cook about once every two weeks, Brian is around most of the time to help with kids (and even when he is working he is usually not gone for more than 4 hours a day). I do not have to watch sports, but we love the Olympics every 4 years. The list goes on and on. Thanks for cleaning Brian. You are really much better at it than I am. I'll go back to my full time job of keeping our infant breast-fed. We have spent a beautiful fall day first at Wheeler Farm and then just laying around as a family on a blanket outside before Brian got most of our dinner from the garden. We kind of love this time. Jane loves her overstimulator bouncy chair- surrounded by toys, music, an overhead revolving mobile with mirrors, all mounted on a bouncing vibrating chair. The box said it's guaranteed to produce ADD in a few short months. Colin also loved the overstimulator, it was a gift from some of our good friends in Indiana when he was born. It kept her very happy while we canned tomatoes. Last Saturday we decided to haul in the ripe tomatoes for some canning fun. We spent the better part of the day canning whole tomatoes and sauce. The sink above is full of celebrity tomatoes. A basket full of fat Brandywine and Yellow Pineapple toms. Normally, we just use these for slicing (they make a beautiful Caprese salad and incredible BLTs), but we had enough to do a few quarts canned. Here they are lined up in the storage room- 22 quarts so far this year. Since we recently had a delightful influx of friends from Indiana, we decided to celebrate with our own sushi making party. This is something we used to do in Bloomington fairly often with our pals. As a rule, we find that when we go out for sushi, we don't usually feel stuffed at the end of the meal. But when we make our own- it is no holds barred. Below are some shots of our creations. We are Maki people. Serious eaters of sashimi would probably sniff at our recklessness, but we can't help it. I'm not capable of making a role with less then four ingredients. We had Ahi Tuna, Yellowtail (Hamachi), salmon, eel and shrimp. Sue Anne made us some delicious miso soup. Fun Soy wrappers in fashion colors. We may not be sushi artists of this caliber, but we like to let the creative juices flow. After sushi we had a campfire out in the field. It was our second fun time with camp fire. At the first one, we made some gourmet adult smores- Home made marshmallows (no comparison to store bought), exotic dark chocolates, butter cookies and ginger wafers. We love our Indiana people. They know how to hang out.